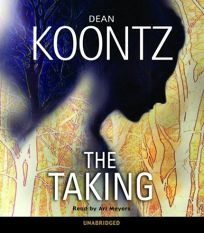 Actress Meyers delivers a curious performance of Koontz's latest novel (following Odd Thomas). Executed with a kind of curt, crisp precision, her portrayal of the main character, Molly Sloan, is unexceptional and doesn't encourage the proper empathy from the listener, which is unfortunate because Molly and her ex-priest husband Neil are up against steep odds. They wake one morning in their small California town to find that a strange-smelling, luminous rain has heralded a worldwide change. All communications, even the Internet, cease functioning, but only after broadcasting some disturbing sound snippets. Soon Molly and Neil find themselves in a world where most other humans have been hunted down, the dead are reanimated and extraterrestrial invaders harvest souls. On the few occasions when Meyers gives voice to supporting characters (e.g., children, a possessed doll, the walking dead and the evil alien beings), her reading changes from run-of-the-mill to downright chilling. The transformation is astonishing and causes the listener's gooseflesh to rise; alas, these instances are far too infrequent.